My children love to snack. I have two very active boys. They eat 3 meals a day and still grab snacks more times than I even dare to count in a day. I try to always have plenty of healthy snacks that are easy for them to grab and eat. It gets tough around the holidays with all the cookies and candy to make sure they are making healthy snack choices. So today instead of baking cookies I decided to try to make granola bars. I had never made granola bars before but knew I needed an easy recipe so that I could whip some up whenever needed. I looked around online for a no bake version and found a very basic recipe than I added my own twists to increase the nutritional value. It is not always about what you take away (less fat, less sugar, less processed ingredients, etc) sometimes what you add can be just as important. I added chopped peanuts, peanut butter, and chia seeds to my granola bars. I also cut the amount of honey by half since I was adding peanut butter. The peanuts and peanut butter help boost the protein in these treats so they will stick to your ribs longer . The chia seeds add those ultra important Omega 3 fatty acids. I think chia seeds are so much better than supplementing with fish oil for healthy brains and bodies. 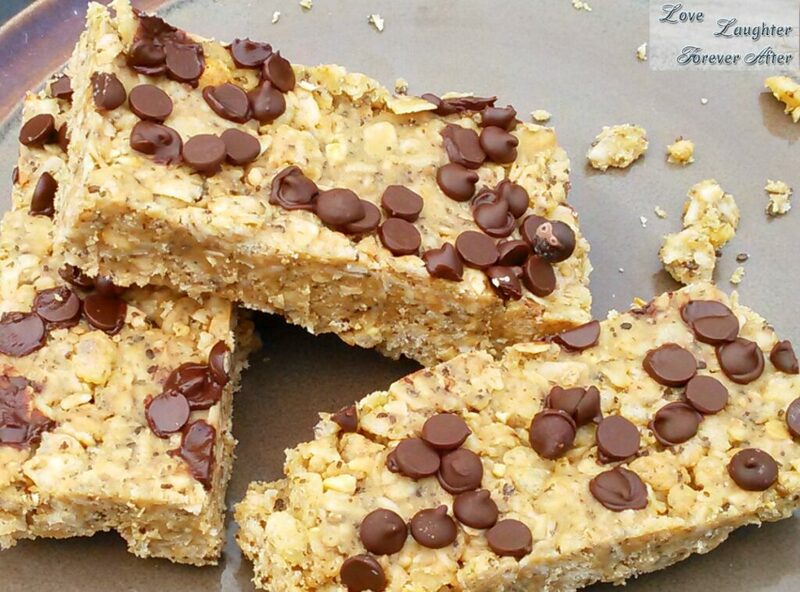 Chocolate chips are optional but who doesn’t love granola bars with chocolate chips. Healthy eating is all about moderation so give em a few chocolate chips since you know the good stuff is inside the bar not on top of it. Mix together oats, cereal, peanuts, and chia seeds in a separate bowl. Melt butter, brown sugar, and honey in a saucepan. Bring to a slow rolling boil and boil for two minutes. Remove from heat . Add peanut butter and vanilla, stir until peanut butter is melted. Add dry ingredients to the melted mixture. Stir well. Press into a lightly greased cake pan or jelly roll pan. Make sure you press dwn hard. Then sprinkle withh chocolate chips and press lightly. Allow to cool and then cut into bars. If your bars do not stick together after cool, then you need to boil the sugar mixture just a bit longer next time. For now just stick the bars in the fridge for a bit.